With the original Blood, the folks at Monolith created one of the goriest and most brutal 3D shooters ever to grace a computer monitor. Well, this fall Caleb is coming back in the form of Blood 2: The Chosen, and this time he's joined by the other three Chosen, all determined to bring down the Cabal. Unfortunately, some forces are messed with and hordes of baddies are unleashed. Good thing you've got a lot of big guns. Will there be any horror-movie references like in Blood? I loved that Jo-Jo the Idiot Circus Boy thing. Yes, we will have movie references in the game, both horror and otherwise. I'm not going to reveal what any of them are :), but they will be there. Jo-jo will most likely make some kind of a return as well. I loved Blood and the way it managed to rekindle the Build engine's flame. What I'd like to know is, in your opinion, how do you think your single-player game compares to Unreal? That's kind of a subjective question, because it depends on what I think of Unreal's single player game. Not to criticize Unreal, because I thought they did a great job with some things, but I lost interest in their single player game fairly quickly. The levels were beautiful, but after awhile you got used to that and then the game just seemed repetitive and slow-paced. Their AI was good, but more like playing bots than real creatures. I don't think advanced AI should mean that single player enemies play like bots. I'd rather see enemies that react like real people or creatures would. Bots are used to emulate multiplay, and if I want a multiplayer experience I play a multiplayer game. I don't want a multiplayer experience in a single player game. Blood 2 uses the Lithtech engine, which is getting a lot of attention through Shogo, which is nearing release. Most web sites that have previewed Shogo say the graphics are better than Quake 2, but not quite as good as Unreal, but the performance is better, and the special effects are better. So from a graphics standpoint Blood 2 looks great. The single player game has a lot to offer beyond good graphics though. The environments are creative and based around real locations, with some really impressive looking levels like a moving subway train, an airship in flight that you can walk around on outside, and a rather gruesome meat packing plant. There is a fairly complex story that is told throughout the single player game, involving many primary and supporting characters, and several dramatic confrontations as well as times where the other three Chosen will fight alongside you. Progress through the single player game is very logical, and moves almost like a movie. Using Lithtech's LOD system we can display a LOT more models on the screen at one time than either the Quake or Unreal engine, which allows for gameplay where you are fighting a lot more enemies at a time. And on creatures, that area has been one of our main focuses. They are simply cooler than any creatures I have seen in a game. I don't like to say such non-descriptive statements, but it is hard to explain in an interview. Zombie-like Soul Drudges stagger at you, swinging a variety of bludgeoning weapons. The spider-like thief attaches to your face, causing nausea in the form of screen effects, and the human enemies use a variety of weapons and techniques, like dodging, and running while firing. Most of the movement has been motion captured, so the creature animations are much more vibrant and realistic than most other games. Also, the design of our creatures allows for a much broader arrangement of play styles. In Unreal, for example, they have smarter enemies, but fewer of them. In Blood 2 we have a variety of situations, smart enemies that you fight one-on-one, dumb enemies that you fight in large groups, and a nice mix in-between. The humans can be mowed down in a way that hasn't been seen since Doom, but some creatures will take a serious beating before going down. How do you expect to ever compete with Quake Arena in the multi-player front? But I think I know what you mean. I'm sure Quake Arena will be cool, but it will still be Quake. 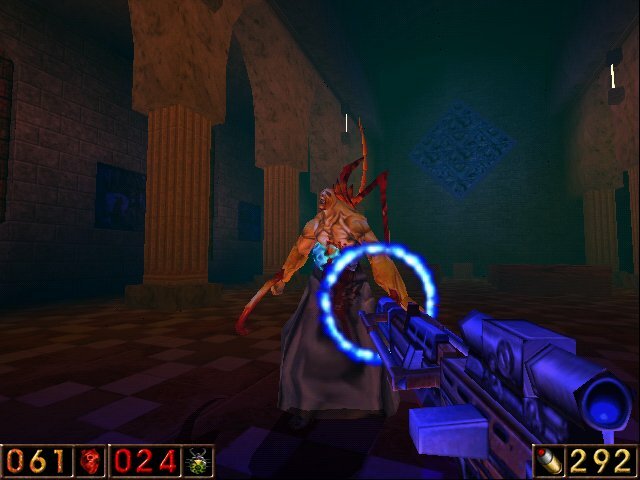 One of the main things I think Blood 2 has to offer is that it isn't Quake, and it doesn't play like Quake. Even most non-id 3D shooters can't say that. But Blood 2, like Blood, simply offers a very different style of game than Quake. The movement is faster, the jumping is higher, many weapons can be used dual-handed, and the weapons are a lot more powerful. Bloodbath also just has a lot more style. Four playable characters each with a lot of personality and one-liners that are used during the game. Humiliation Deaths, which allow you to mock your defeated opponents. You can use many weapons dual-handed, one in each hand, and nice touches like the "voice", an in-game multiplayer commentator, and being able to kick around body parts, and dynamically dismember dead bodies. Sure these are just bells and whistles that don't affect gameplay, but they certainly add to the fun. Finally, Blood 2 offers something that no 3D shooter to date has offered: in-game character customizability. You can modify and customize your character's physical attributes and weapons, allowing each player to customize their playing persona to their personal style. I go into this more in your next question. How do the characters differ? The differences in the characters revolve around their physical attributes, and a special ability. Physical attributes are Speed, Strength, Resistance, and Magic. Speed controls how fast the player moves. Resistance controls how much damage the player can take. Strength controls how much ammo the player can hold and some aspects of recovering health. Magic controls how much magic ammo the player can have, and how fast magic ammo regenerates, and some aspects of how armor is recovered. I need to explain magic before I go on. Some of the weapons in the game are magic-based, like the Voodoo Doll and the Decapitator. These weapons use magic ammo called Focus. Focus is not picked up in the levels, but rather is regenerated with time. The regeneration rate and upper limit for how much Focus you can have is defined by your magic attribute. The differences between the characters are that each have different default values of these abilities. Caleb has high strength, average speed and resistance, and low magic. Ophelia has high speed and magic, but low strength and resistance. Ishmael has high magic, average speed and resistance, and low strength. Gabriella has high strength and resistance, but low magic and speed. Each character also may have a special ability, but we haven't finalized that yet. However, we didn't stop there. You can modify any character's attributes as you see fit. For example, Ophelia has high speed and magic, but low strength and resistance. You could crank up Ophelia's strength by pulling it away from her resistance. You can also swap special abilities. By default each character is very different, but since you can change attributes at will you aren't limited to their default configuration. Yes, this means all the characters can basically be the same on a gameplay level, so you may be asking what's the point of having multiple characters? We didn't want multiple characters to act as a restriction on the player, preventing them from using certain weapons or having certain abilities, we wanted the player to decide what they wanted there character's abilities to be, so we've put those things completely in the hands of the player. Want someone fast but with high strength? That option isn't one of the defaults, but is still possible. I think putting these decisions in the hands of the player is very important, because it allows the player to make the game what they want it to be. The other thing I like about this system is that while it adds elements of a role-playing game, it doesn't slow down the action at all, since all these decisions are made when you originally make your character, and not altered in the game itself. The individual characters have default values so that players who don't want to mess around with creating their own character don't have to, but rather use the character that suits them the most. We'll also include several pre-made versions of each character for a variety of quick options. Finally, having different characters is appealing simply from an aesthetic standpoint. With each character you not only get a different look, but different height (which affects your first person viewpoint), and tons of unique one-liners and dialogue that give your on-line persona personality. :) The dialogue is, of course, optional. Don't you think that the bloody-gore-type of game (like Blood) is getting old? People want to see more thinker's games (Rainbow Six), I know that I do. Which FPS do you think will be your biggest competition? I was wondering what you think you can do, as far as creative expression, with game design that you can't do with other forms of media, like movies or novels. That's an interesting question. I think the main thing you can do is invest the player in the story in a way that simply can't be done in any other medium. In a movie or book you basically follow the actions of someone else, with no control over how the story turns out. But in a game the player becomes the character. A victory feels more satisfying, and a defeat is more painful. I think this has only been touched on in computer games, mainly because up until very recently story has taken a back seat to gameplay. I think in a way that should always be the case, but in the future I think we'll see more games that have a whole section of the team that is just working on the story and accomplishing elements of that. Are we going to see some of the wildly innovative settings in Blood 2: The Chosen as we have seen in Blood (i.e. the moving train level, hospital/insane asylum level, etc.)? Absolutely! I don't want to reveal too many of the areas, but we have an airship level where you can walk around on the outside of the ship while it is in the air. We have subway trains you can ride and fight on. We also have some other inventive locations, like a slaughterhouse, research labs, and a museum. What are some of the neat features you've been able to do with the Lithtech Engine that previously wasn't possible in any other level editor you've used before? Or what are some of the unique or unprecedented features of the Lithtech Engine? Location Specific Damage, allowing recoils, deaths, and damage specific to where you shoot your enemy. Shoot them in the head, and they'll die instantly, with an appropriate death animation. Shoot them in the leg and they'll grab their leg, and then limp after you. Code Accessible Node Transformation and Linking (CANTAL). This allows us to attach models together. In Blood 2 this allows us to put the actual weapon the player or enemy is using in their hand. It also allows us to attach limbs, and then separate them dynamically, so that creatures will dynamically lose limbs when they die. Location-specific reflection mapping, which allows for very realistic 'chrome' effects on the weapons. The metal parts of the weapons shine and reflect as you move around. Volume-based fog, giving underwater areas a fog effect that obscures vision at a distance. Displacement Mapping, which creates wave effects that make our water rise and fall in waves. These are only some of the features in Blood 2. How does the enemy AI. in Blood 2: The Chosen compare to other current 3D shooters you've seen on the market? What are some of unique "abilities" the enemy will possess in terms of intelligence and moves? I think Blood 2's AI is very strong. Instead of trying to emulate a bot with our AI, we're trying to make them act like real creatures. Real creatures have a will to live, and will not always make the player their first priority. Human enemies have a variety of skills they can use. They carry multiple weapons, have limited ammo, and can pick up new weapons and health. They also have tons of animations they can use. You won't see the enemies run at you, stop, and then fire. They'll roll from side to side, forwards or backwards. They'll fire while running or walking at you, attack crouched and standing. Some of the creatures can attach to you to do damage, and you must hit your 'use' key repeatedly to get them off. Some enemies work together, some have mortal enemies other than the player. Some enemies use special abilities like teleporting, or jump over and around you to through off your aim. I think people will be very impressed with Blood 2's creatures and the code that drives them. Well, as I mentioned earlier in this interview, Quake 3: Arena is still a ways off, and won't really affect our sales. I think Blood 2 will do great. There are a good number of shooters coming out, some people think too many, but that has been said many times before, and every good shooter has always done well. Blood had outdated technology and still sold really well. I think there is more than enough market to support the current crop of shooters, and once people see Blood 2 I can't see how they'll pass it by. What kind of death animations are there? Also will there be any vehicles? What kind? Lots. Each human character has over a dozen death animations, all of which are specific to where they get hit, and each creature has nearly that many animations. On top of that we've created a dynamic system for limb loss that will make each death seem unique, as the enemies are dismembered as they die. We have vehicles in the game, but not vehicles you can drive. Useable vehicles really need large areas to be worth having, areas bigger than have ever been available in any 3D shooter except Skynet. Unless you are planning to base a large section of your game around this feature it seems to me like it won't be very satisfying, so we didn't bother adding it. How much effort went into the programming of the network code. In other words will there be multiple patches for improved net-play like in Quake 2? The engine has been built from the ground up with multiplayer in mind, and a lot of time has been spent on the networking code. Early performance tests in Shogo have been very promising, but not quite as good as Quake 2. Perfecting Internet-based networking is pretty difficult to finalize before the game is being widely played over the Internet, and there are always improvements that can be made. That's why every major shooter that has been released has had multiplayer patches. Our multiplayer performance should be great, but I expect we will release performance-improving patches after the release. I've checked out the Chosen bios. Now, when you talk about the different kinds of strengths and powers each one has, such as weapon capacity, does that mean that each of the four Chosen will have a different set of weapons? I mean, like ten different weapons for each persona, with maybe a standard one between them all? How will this work, and how many weapons will be in the final game? We didn't want to restrict the player to a certain weapon setup. In games that have done that I've always been frustrated by the inevitably smaller number of weapons you could carry at once, and the fact that my favorite weapons would be spread across several characters. In Blood 2 any character can use any weapon. There are around 20 weapons total, but the player can only carry 10 weapons at a time. In single player when the player reaches their maximum of 10 weapons they must drop a weapon they are currently holding to pick up a new weapon. In multiplayer, you choose all your weapons ahead of time, and spawn in with a full arsenal but with little or no ammo. You don't pick up weapons in multiplayer, only ammo, items, and power-ups. So even though you may have the big bfg weapon when you spawn in, you won't have any ammo for it. Also, many weapons can be used dual-handed, like carrying a shotgun in your left and right hand, but that requires two weapon slots, one for each hand. What will the "minimum" system requirements be? And what API's will be supported--is it going to require a Voodoo series 3D accelerator? Will Blood II: The Chosen include support for AMD's 3Dnow! instructions? At release time probably not, but we are working with AMD to add it, so it may come out in a patch. The main issues are that while we support D3D, we don't use all their instructions, including many of the things that 3Dnow increases performance for, so the amount of speed increase we would get with 3Dnow is questionable. Is the game still on schedule for a release around Halloween?